After a three year delay 6 Souls is finally available to watch here in the states. The film was released in the UK under the title Shelter back in 2010. When a movie sits on the shelf that long it’s usually the sign of something rotten in Denmark, but 6 Souls is actually a pretty fun movie with a killer cast. 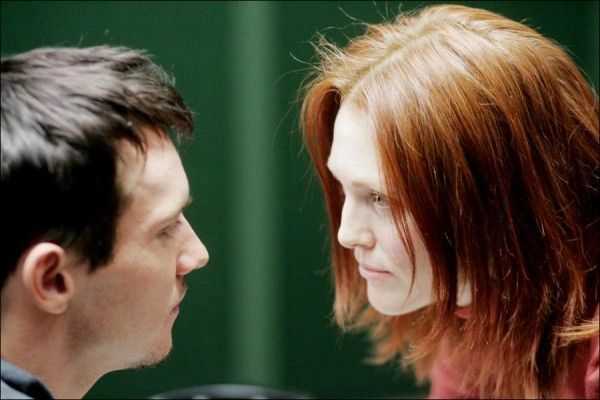 The story follows psychiatrist Clara (Julianne Moore) as she attempts to unravel the mystery surrounding a Dissociative Identity patient (Jonathan Rhys Meyers) with a unique set of symptoms. Directed by Mans Marlind and Bjorn Stein (Underworld: Awakening) and written by Michael Cooney (Identity), the film also stars Jeffrey DeMunn and Frances Conroy. During a recent press day for the film I landed an exclusive phone interview with Michael Cooney. We talked about the similarities between 6 Souls and Identity, the film’s impressive cast, his research for the mystical elements of 6 Souls, and how the script changed over the course of production. We also discussed his writing process, his stage career, what’s coming up next, and a lot more. Hit the jump for the full interview. Both Identity and 6 Souls have to do with dissociative identity disorder, and The I Inside centers around amnesia, have you always been interested in these sort of psychological phenomena or did all these stories come out of a single period of research? Cooney: All those things are all sort of stitched together, and there’s one other, they sort of form this foursome, “Mind over Murder” or Murder in Mind, one’s the play, one’s the film version. They deal with amnesia, split personalities; it’s a foursome that works together. I’ve been interested in the field for years and years, but on a sort of personal level I had this strange experience of when I am writing, years ago I noticed this, that at the end of the writing day, if I was deeply into something I was scripting, I would look over and on my desk there would be these handwritten phone notes that obviously I had had a phone call and had written down “pick up milk” or “dry-cleaning” or whatever the note was, but I had no recollection at all of having that phone call. That was just of interest to me; that there was some validity to the idea that we can compartmentalize our memories. So I began researching that, and each of the stories, they each have a different twist and a different interpretation, but the research for one would spark the idea for the next. When I was writing Identity– spoiler alert for people who haven’t seen Identity, but the twist in that is multiple personalities, and in researching dissociative identity disorder I soon realized that not too long ago the diagnosis for people suffering from those symptoms was possession by demons and would be dealt with by the Rituale Romani, the exorcism. It was wrong for Identity but I just thought that was such an interesting, spooky notion. It occurred to me I wonder if there’s a story that suggests perhaps that we shouldn’t have abandoned those moral, spiritual, supernatural explanations for what might be going on, and from that point you go what kind of character would you weave into that? And so you have, in 6 Souls, the Cara character that is a staunch advocate that it doesn’t exist and so you want then an opposite of that, her father, so you get a nice father-daughter dynamic. That’s where it’s come from. Speaking of the characters, the cast that was put together to play those characters is amazing. What was your reaction when you found out about the cast? 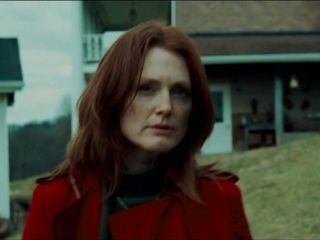 Cooney: It started off with Julianne Moore, and when you get the phone call that Julianne Moore has said “yes” then you go, “Where’s the catch?” There’s always a “yes, but”, and when you find that there’s no “yes but”, that she wants to do it, as a writer having created the character you breathe a heady sigh of relief knowing that you’re going to be in very capable hands. Then Jonathan Rhys Meyers came on board and I’d seen him play so many different roles, so many different characters and he worked so hard on this film. It’s all very well me coming up with the idea- you don’t think of the poor actor that’s going to have to do this. When I wrote Identity, the whole movie takes place in the rain, it didn’t occur to me that some poor actor would have to spend eight weeks of their life soaked through to the bone, freezing cold in the pouring rain. Even though it was climate controlled on a nice sound stage, they were very wet for a very long time. When you turn upon the set and get these looks from the wet actors you realize what you’ve done. That was physical, what emotionally and mentally we were asking Jonathan Rhys Meyers to do, I think he does beautifully. Each of the characters that he creates in 6 Souls, he approached them with the dedication that you would if it was one role in a movie, but he has half a dozen of them. He had dialect coaches, voice coaches to get it right, and to see him carry it off- I think is terrific. I think that the risk you run with creating a character like that is that it could become theatrical, it could become a big performance to show the differences of the characters, and I think Jonathan pulls off a wonderfully subtle performance. There’s little things between these two main characters Adam and David, there’s tension in the shoulders in one and not in the other, and he carries this through the entire production. I’m deeply impressed. Then you throw in Jeffrey DeMunn and Frances Conroy in the supporting roles and I think we’re in good hands. Talk a little bit about what your research was like on the more spiritual, magical elements of the film. Cooney: Well it was interesting because this screenplay went through some time of development and the original spec that I wrote was based in the Salem witchcraft. It was based in Boston and that was the history we explored, but soon in the development of the screenplay we thought that that was a little cliché so I started looking online for different spiritualties, different witches that there could be. I happened across this wonderful amalgam of the- I forget which tribe it is, an Indian tribe in the Appalachian mountains combined with the Scottish settlers, and that is the ancestry of those people we’re looking at. A native American tribe, their spirituality, and the more Christian beliefs of the Scottish settlers formed this lovely sort of mother nature appreciation combined with Christianity and that’s where it came from. The research was, unfortunate to say, just online. There is such a wealth of information available that that’s where it was. You work both on stage and on screen can you talk a little bit about the differences in your writing process when you’re writing for the different mediums? Cooney: The writing process is quite different, the fundamental difference- I occasionally talk to people who want to be screenwriters and the piece of advice that I give them is that a screenplay will be read a thousand times before a foot of film goes through a camera, or a digital byte goes through a digital camera, it has to be readable. 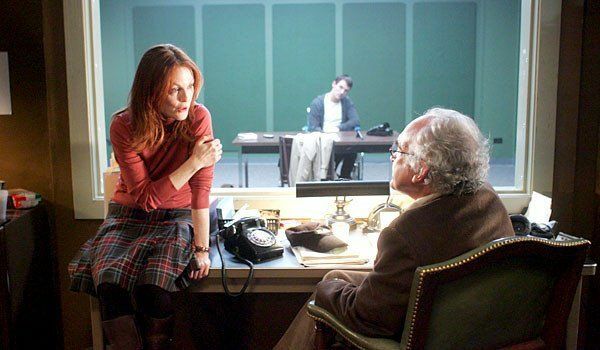 In fact, screenplays are written to be read whereas stage plays are written to be performed. A stage play is much dryer to write with the stage directions, upstage and downstage, entrances and exits, it’s a much dryer read, whereas a screenplay- and my screenwriting changed completely, because I came from theater, so I write quite dry screenplays and then, thank goodness, I read From Dusk till Dawn by Quentin Tarantino and I then read everything by Tarantino. My advice to writers, I always suggest Tarantino, but find your favorite films and read the screenplays. From Dusk till Dawn is the best hour and a half read you will have. They are so easy to get through, so evocative, so visual, and so efficient. In a line and a word he creates a mood and emotion in a scene. He does it beautifully. That is the goal that I strive towards is to create something as efficient as that. The constraints of a stage play- in a screenplay you can cut to another location, which you can’t do, obviously, very easily on stage. Three of the four plays that I’ve written have all been set in real time, it’s two hours of real time and I find that to be the most challenging thing I do as a writer, to create two hours of real time. Because two hours of my day is incredibly boring, two hours of most peoples day is incredibly boring. In a movie you are taking snippets of two hours, the movie might take place over a week or a month and you are taking the best two hours out, whereas a stage play two hours, if it’s going to be set real time that is the biggest challenge I find and the biggest difference between the two media. Talk a little bit about your method as a writer, are you the type of writer that has a couple golden hours in the day where you pour out a lot of work or do you take the full time job, morning to evening approach? Cooney: I take the full time approach meaning that I do sit in front of my computer all day long, the truth is if I was writing out a screenplay, just copping it out I could do it in a half a day probably, just write it. So there is obviously something else that you’re doing that entire time and curse the internet from the last few years that’s been there, Twitter, Facebook, MySpace, whatever, they’re just saying “look at me, look at me”. It is becoming more distracting. My best writing happens when I wake up, in that half sleeping dreaming state is when I find- I’ll write for the entire day, the first thing I do in the morning is read what I wrote the day before and what one tends to find is that what I’ve written in the first two or three hours of the day I have to edit less than what I’ve written at the end of the day. The other thing that sometimes happens is in the middle of the day I’ll fall asleep for a moment and if there’s a problem that I’m facing, wondering where the scenes going to go, what’s the point of the scene, where this scene should shoot off, whatever it is, I’ll just lie down on the couch and fall asleep for a while and, touch wood, I find that when I wake up I’ve got some kind of solution that allows me to keep going forward, again in that semi sleeping state. When you write do you come upon the characters or the plot first or do they arrive at the same time for you? Cooney: I usually have the finished plot first and for a thriller you usually have the twist at the end, so the first thought usually is “That would be a good setup. That would be a good twist”, and very soon after that is when you go “What characters?” So with 6 Souls, like I said when I was researching Identity you come up with, “Okay I want to do something about proving or disproving dissociative Identity disorder so what’s the best character to have?” I want one character to absolutely believe in it and one not to, so let’s have the daughter and the father. You find when you start to write the first plotting out, the characters are in service to the plot, but the moment you start writing dialogue, for example when you write that first scene where there’s an opening monologue from Cara, Julianne Moore, now you’re not thinking about plotting, the moment you start writing a piece of dialogue is when the characters come to life for me. That is when you’ve got the characters driving the beginning of the story and in the back of your mind you have the plot anchoring where it’s going to go at the end. So with something like 6 Souls, you set up these characters with the differing points of view, the relationships, the father and the daughter and her daughter, you set up those relationships knowing that all of those points are going to lead you to your twist or the third act build. The initial thought is usually a plot and then for a moment the characters are of service, but the moment I start writing the characters come to life. I’ve never been one of these writers that can jump ahead and start writing scenes in the second act. I might know a point that I want to hit, or I might know plot points that will drive it and twist it through, but I never jump ahead and write something because I simply do not know what that character is going to be who walks in through that door. It is a process of discovery for me. When you write that first act they are hopefully different people from the beginning of your first act, to the twist in the second act, that their beliefs, who they are, and their arc is already changing. I find that I have to go on that journey in a linear fashion with them, I can’t just jump ahead, which I know some people can do very successfully. You mentioned that at first you were going to set the film in Salem and you changed your mind on that, so going from the inception of the idea through the final draft, then shooting and editing, to what I watched the other day, what else in the story changed and how different was the final result from what you started with? Cooney: From the first draft this script changed quite a bit, it went through some development. It’s tricky because you can read it and all the plot points that drive it through are still there, but this script in particular there were a number of changes. Moving it from Salem had a knock on effect to it. I think the script is probably ¾ the same script and ¼ of it is new or edited from the first draft that sold. The film was released overseas, but it’s been on the shelf quite a while before finally debuting here in America. What’s it like for you to finally have it see the light of day over here? Cooney: It’s lovely, I’m very excited. I love the movie and I’m excited for my friends here to see. I’ve raved about Jonathan Rhys Meyers, but I think Julianne Moore gave a wonderful performance of a mother who puts her daughter in terrible, terrible jeopardy unknowingly. I think it’s a terrific performance and I’m so excited for everyone to finally get to see it. I have to tell you man, when you watch a movie that’s been on hold for that long you don’t really know what you’re going to get, but I really enjoyed it. Cooney: Thank you, it’s funny, sometimes when you’re told a movies the best thing you’re ever going to see, it’s fabulous “Oh, god you’ve got to see this.” You’ll sit down and it has the opposite effect. Things like this you watch and you go, “There’s not a lot wrong with it, I actually enjoyed that.” You’re not setting people up that it’s the greatest thing that’s ever happened that may work to your advantage. Cooney: I’m writing, I spent some time trying to develop TV series and that’s sort of taken a moment away from writing specs. My favorite thing to do is to write a spec, just to come up with an idea on my own for better or for worse, and I’ve got a couple dozen of the for worse ones sitting on a shelf that never sold. My favorite time writing, and I know this will sound selfish, is when I’m not being told what to do. When I can just do whatever and if it works it works, and if it doesn’t it doesn’t, and that’s what I’m getting back to. I’m just entering the third act on a new spec thriller and one of my favorite things about this thriller is- I have two kids, and I was worried that the kids were going to be upset by the spooky things I write, turns out both my kids love the spooky stuff and they’re going to see them all soon anyway. So the point is that my eight year old daughter, Spencer, I sat her down and I said, “Daddy might get a bit quiet some nights”, because when I’m writing these things I get a bit quiet. I explained to her and she understood totally, and I explained a little bit about what it’s about and a week later my daughter came to me and said “Daddy I have a tittle for you”, and I thought in the back of my head, “Oh here we go, what’s this going to be?”, and she looks at me and she goes “In the Dark”, and I went “Oh, it’s so perfect.” You keep people in the dark with a secret, you can physically keep people in the dark, it works so well for the story. So that’s the title it’s called In the Dark. Spencer wants 10% of the profits, but I think we’re going negotiate that. Do you see yourself continuing to write in this psychological vein or are you looking to explore new things? Cooney: I think that I have actually exhausted the multiple personalities, I’ve written four of them and I think it’s completely mined out now. Actually I’ve got one that were going to do as a little low budget thing that plays with that for a second, but it’s almost a one scene offhanded joke of “No, that’s actually not the twist of what’s happening here because we know that’s all Michael Cooney seems to write, but no that’s not actually the twist, look for something else.” I have, not a big book of ideas, but a small book of ideas that I jot things down on and they are more conventional thrillers the next couple of things- hey no, see, I’m talking out of my keister. The next spec that I’m going to write is about ritual possession so that will have some multiple personality areas in it as well unfortunately. So maybe there’s one more. This will be a spooky possession movie. There’s other things out there to do. I’ve got a comedy idea, because strangely enough the most successful things I’ve ever written is actually a stage play comedy called “Cash on Delivery”. I know it’s very bizarre, but that’s the one. It’s now almost 20 years ago that I wrote it and its still performed all over the world, so it’s very nice to have that in my back pocket. There’ll always be new things to try. Having a successful stage career, do you try to balance out your writing between stage and screen? Do you like to go back and forth or do you just do what comes to you? You’ve directed on stage and you directed the Jack Frost movies, is that something you want to do more? Do you consider yourself a director as well as a writer? Cooney: I’m a writer. I directed the Jack Frost movies because no one else wanted to direct them and I had a blast. I had so much fun, and if someone ever comes up to me and goes, “Do you want to make Jack Frost 3? Here’s $500,000”, I am in. I had so much fun making them. The truth is when I see what Jim Mangold did with Identity and when I see what Mans Marlind and Björn Stein, the directors of 6 Souls did with that, if I had money I wouldn’t let me anywhere near a camera. I leave it to the professionals. Once you realize what a professional production can do, how it can elevate your script, for me, leave it to people who are better. [Laughs] I probably shouldn’t say that because there might be someone who thinks they should offer my next directing gig. It is nice to be in control and the cappuccinos and all that sort of thing.